Starting at 18:42 ET (5:42 pm CT) on April 26, go to NOTREDAMEDAY.ND.EDU to watch the 29-hour broadcast LIVE from LaFortune Student Center and other places around the world, including Hong Kong, Italy, and Jerusalem among others. The broadcast will feature guests Joe Theismann, Tasha Alexander, Nicholas Sparks, Arienne Thompson, Alex Coccia, Notre Dame Trumpets and many more! During Notre Dame Day, please make a minimum gift of $10 to the University to receive five votes to cast for specific Areas of Interest at Notre Dame that matter most to you – including the Notre Dame Club of Austin’s Scholarship Fund! 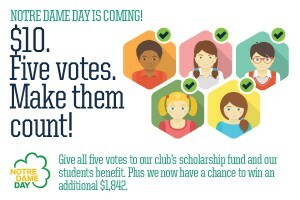 Voting will determine the percentage of the $1 Million Challenge Fund that will be distributed to each Area of Interest. Your five votes have the potential to be worth a total of $100, a 10X impact! You can find the ND Club of Austin’s Notre Dame Day page here. Please join the celebration on April 26!